Pre-Order The Lazarus Covenant, Commemorative 10th Anniversary, Second Edition NOW! DOWNLOAD A FREE COPY OF THE LAZARUS COVENANT, CHAPTER ONE! In Bosnia, the past is prologue for one man who must come to terms with a violent and tragic past in order to prevent a renewed war… and an unimaginable holocaust. In the latter years of Tito’s Yugoslavia, two young boys, cousins Marko and Celo, come upon a mass execution in progress. As they witness the executions and try to help a near-dead survivor to safety, they are pitted in a desperate struggle for survival that forces Marko to flee to Northern Ireland. Thirty years later, as war threatens to ravage the Balkans once again, Marko reluctantly returns to Bosnia as a UN police chief. On the day he arrives in Sarajevo, he is notified of a brutal assassination that he must investigate. Soon, ghosts of Mark’s violent past return…. News of the assassination quickly arrives at a White House desperate to avoid another Balkan War. When General John Thorpe is informed that an Islamic Jihadist group in Bosnia may have stolen Plutonium, he flies to Sarajevo to find out if the incidents are connected. 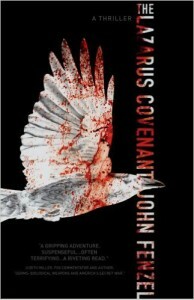 The Lazarus Covenant is a story of profound personal transformation and global suspense. In their own unique ways, war crimes prosecutor Sandy Evenson, Serb war criminal Celo, and General Thorpe each force Lyons to confront his own demons, his own humanity, and a deadly religious sect assigned the mission of protecting the Vatican from catastrophic threats. An explosive international thriller, The Lazarus Covenant explores the scourge of extremism, terrorism and war in a haunting tale of friendship, faith and forgiveness. Writing from his own experiences, John Fenzel relates this story authentically in dramatic settings that extend from the Oval Office to the Balkans, all in a time of extreme crisis.